Craig Kauffman was included in several exhibits with seminal Minimalist sculptors, during the 1960s and more recently. In 2004, The Museum of Contemporary Art Los Angeles presented “A Minimal Future? Art as Object 1958–1968,” including the work of forty American artists in an historical and scholarly examination of Minimal art, organized Curator Ann Goldstein. The catalogue essay (by Susan L. Jenkins) states “Like Judd’s “specific objects,” Kauffman’s vacuum formed plastic works exist in a space between painting and sculpture, although Kauffman has always considered himself a painter. The three-dimensionality of the earlier illusionistic paintings was now thoroughly replaced by the literal presence and three-dimensionality of works that increasingly projected from the surface of the wall.” These photos of the MOCA installation show Kauffman’s work in the company of his colleague John McCracken’s sculpture. Installation view of “A Minimal Future? Art as Object 1958–1968” exhibition at the Museum of Contemporary Art, Los Angeles in 2004. Courtesy the Museum of Contemporary Art, Los Angeles. Photography by Brian Forrest. In 2011, the New York Times published a Roberta Smith piece on the Museum of Modern Art’s re-installation of its permanent galleries. Ms. Smith wrote, “Over the past few months changes of this kind have been unfolding in some of the most hallowed and closely watched galleries in the world: those that the Museum of Modern Art devotes to its unparalleled collection of painting and sculpture.” The lengthy review notes the changing curatorial vision, and the fourth floor was singled out: “An especially bold-looking gallery juxtaposes the Minimalist efforts of the New Yorkers Donald Judd, Dan Flavin and Jo Baer and the Angelenos Craig Kauffman, John McCracken and DeWain Valentine…” Kauffman’s Untitled work, which was given an entire wall by the curators, was acquired in 1969 by legendary MOMA curator Kynaston McShine. Untitled, 1968, acrylic lacquer on vacuum formed plastic, collection of the Museum of Modern Art. Kauffman’s second major work in the MoMA collection was acquired in 1969, when legendary curator Kynaston McShine organized the show “Five Recent Acquisitions,” which included works by Larry Bell, Ron Davis, Robert Irwin, Craig Kauffman, and John McCracken. This 1968 wall relief painting has been exhibited at the MoMA six times, and loaned to important surveys from the collection such as “American Art since 1945: A Loan Exhibition from The Museum of Modern Art,” a 1972 exhibition at the Philadelphia Museum of Art. Red-Blue, 1964, Synthetic polymer on vacuum formed plastic, 89 5/8 x 45 1/2 x 5 inches, Museum of Modern Art, New York. Courtesy Museum of Modern Art, New York. Installation view of American Art since 1945: A Loan Exhibition from The Museum of Modern Art, September 15–October 22, 1972 at the Philadelphia Museum of Modern Art. Courtesy Philadelphia Museum of Modern Art. Installation view of The 1960’s: Painting & Sculpture from the Museum Collection, June 28–September 24, 1967 at the Museum of Modern Art, New York. Courtesy Museum of Modern Art, New York. It’s easy to think that the birth of the Los Angeles art scene is just beginning to be fully appreciated. After all, the Getty-sponsored Pacific Standard Time: Art in L.A. 1945-1980 has drawn to a close, having given an enormous audience the chance to learn about the range of styles and materials during this period. However, this view overlooks the ways in which these West Coast artists were appreciated in their own time, and the substantial recognition they gained at a much earlier date. Artists from the Los Angeles area and the West Coast were exhibited throughout the world in shows including Ten from Los Angeles at the Seattle Art Museum Pavilion, 1966, Los Angeles 6 by the Vancouver Art Gallery, 1968, and 11 Los Angeles Artists by the Arts Council of Great Britain in London, 1971. Not only were these West Coast artists important, they were important together, and could be shown together without making distinctions between media. 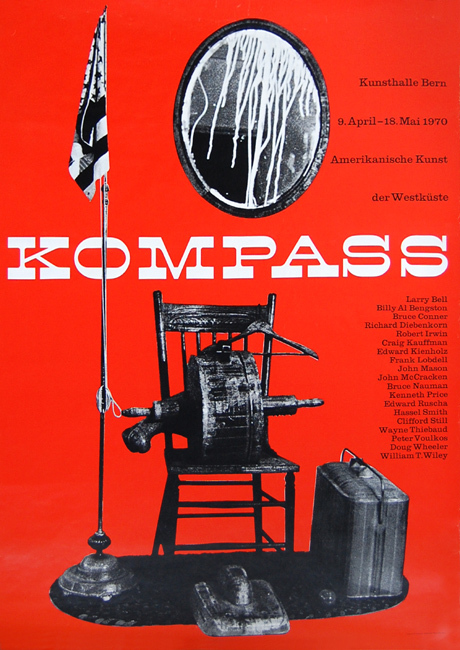 The image you see here is an exhibition announcement for Kompass, a 1970 show at the Kunsthalle Bern in Bern, Switzerland. The poster announces that the show consists of “American Art of the West Coast,” and lists the artists represented, including Larry Bell, Billy Al Bengston, Bruce Conner, Richard Diebenkorn, Robert Irwin, Craig Kauffman, Ed Kienholz, Frank Lobdell, John Mason, John McCracken, Bruce Nauman, Ken Price, Ed Ruscha, Hassel Smith, Clifford Still, Wayne Thiebaud, Peter Voulkos, Doug Wheeler, and William T. Wiley. Seeing such a diverse group of names together really illustrates what was happening on the West Coast. The pluralistic approach of these exhibits reflects an understanding of the multiplicity of styles and mediums that thrived in the Los Angeles scene of that period.